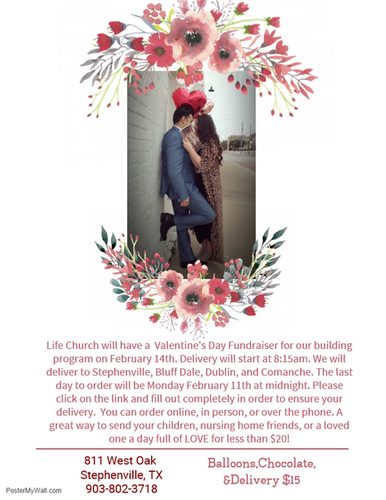 Life Church will have a Valentine's Day fundraiser for their building program. Delivery will start on Thursday, February 14th at 8:15 AM. Deliveries will be made to Stephenville, Bluff Dale, Dublin, Comanche and Huckabay! The last day to order is Monday, February 11th at midnight. Please click on the link and fill out the order form completely to ensure your delivery. You can order online, by phone, or in person. Cost includes balloons, chocolate and delivery!